I love getting tasty foods to try out. Ola Granola is of no exception! Check out my Review. 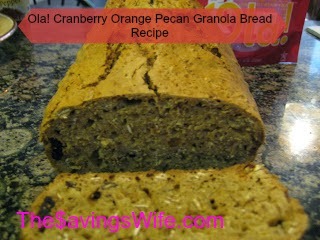 Ola Granola is a mom started "Family Favorite." The founder Dina Houser grew up in a family of eight and carried on the tradition of making homemade granola for her family and as gifts for friends. Her boys even came up with the Name "Ola". Ola Granola is sweetened with Maple Syrup, yum. It also has real ingredients that you can understand, such as Whole grain oats, Wheat Bran, Whole Wheat Flour, and Vanilla. I decided to put the little snack bags "Singles" to the test first and eat them straight out of the bag. All though they were both pretty good I preferred the Brown "Vanilla Almond" one the best. My kids thought so too. It's dry so it could get messy so I decided to use some of the larger bags and check out the recipe section on their website. Not finding anything that I wanted to make beside the cookies, I came up with my own recipe. Mix all ingredients well! I used my stand mixer! Heat oven to 350 degrees and cook 60 minutes or when the butter knife comes out clean. Since trying my recipe I've added it to cereal, ice-cream smoothies and of course the cookies. You can add Ola Granola to yogurt or a bowl of berries and Milk. There is even recipes to use it as stuffing. The possibilities are endless.